To start with, let’s look at the word “culture.” Like the word “brand,” corporate culture has become a buzzword that has been overused so badly it’s almost lost all meaning. For example, some people use the word “brand” as a synonym for “logo.” Others think of it as a product line from a particular parent company (like Cheerios and Lucky Charms - two of General Mills’ cereal brands). Similarly, some people use the world “culture” to mean “ethnicity” or what area of the world an individual comes from. Others might say it has to do with the traditions of a particular group of people – so Canadian culture celebrates hockey, or a particular workplace culture is fun because they have a lax dress code or throw killer holiday parties. For some reason, people feel strongly about the idea of culture, just like how they tend to be loyal to certain brands while passionately avoiding others. A friend recently told me she’s leaving her job because of its “toxic culture.” Another friend just found a new job that was a great “culture fit” for her. These same two women will have friendly debates about which coffee shop to go to – one is fiercely loyal to the Starbucks brand and the other will only buy from locally-owned coffee purveyors. If you asked a room full of intelligent people, you’d get a ton of different answers. 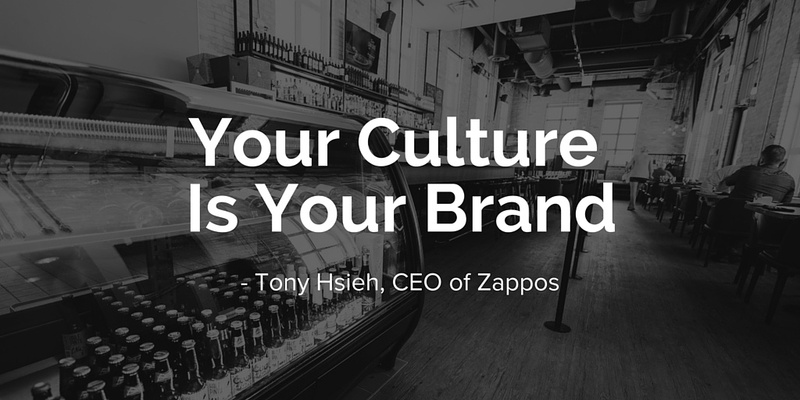 What is the culture of your restaurant? How do you measure it? Is it a good culture or a bad one? How can you tell? And what – if anything – does culture have to do with brand? I bring up the two words at the same time for a couple reasons: they’re both tossed around like crazy and often misunderstood, and I believe they’re actually very closely related. Your brand is simply the collection of everything that people think and feel about your restaurant. When you see a Starbucks logo, for example, what comes to mind? That logo serves as a sort of visual cue to trigger your feelings and thoughts about the company. And whatever comes to mind for you was created over time by every interaction you had with that company. So each time a guest visits your restaurant or calls to make a reservation or goes online to check out your menu, and every time someone else talks about their experience eating there – all of those interactions add up to equal your brand. So if your brand is what outsiders – your customers, the general public – think about you, then culture is the flip side of that. It’s what insiders – your staff members – think and feel about your restaurant. When your employees are getting ready to come in for a shift, how do they feel? 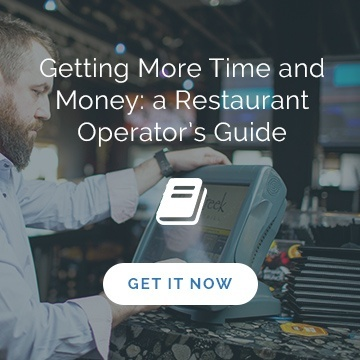 Is your FOH staff pumped and eager to get on the floor and serve guests? Is BOH dreading what they might have to deal with when they walk into the kitchen? How do your employees talk about the restaurant when you’re not around? All of that is your culture. Your restaurant has a culture whether you like it or not – whether you’ve given it a lot of thought or it has completely happened by accident. And that’s true whether you’re part of a large, nationwide chain of restaurants or are independently owned with one or two locations. So, all of those thoughts and feelings that your employees have about the restaurant… where do they come from? 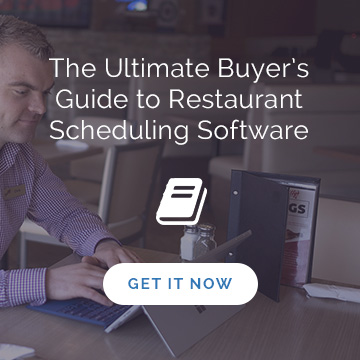 They are built up over time by every interaction they have with your restaurant. It starts even before they’re hired! How did they find out that you were hiring? What was the application and interview process like? Then it just keeps building up day after day: first day on the job, training, learning about restaurant policies, trying to book off time or change their schedule, getting to know their co-workers, communication with their supervisor or with you as the owner or GM… the list goes on. Why should you care about culture at all? You might be thinking, “OK sure, I’ve got a culture in my restaurant… so what?” Well, here’s where I feel the HBR article is missing out. Even though culture is an outworking of a number of things, it really does have an impact on the success of a business. While the word “culture” might seem like just a theoretical concept, it has real-world consequences. Your culture – whatever your employees collectively think and feel about the restaurant – influences the way they act at work. Imagine one of your servers had a crappy experience trying to book some time off for a vacation or maybe they were scheduled against their availability. How are they going to feel about coming in to work? No matter how professional or perky they might be, those negative feelings are bubbling under the surface, and that less-than-awesome attitude will seep into their performance. Even if they can put on a happy face to take care of customers, there’s a good chance they might complain to other employees or let their feelings rub off in other, more subtle ways. Now, that’s not a big deal if it’s just a one-off occasion. Stuff happens. But unless you’ve got the right systems and processes in place and you’re intentional about managing your culture, negative thoughts and feelings can multiply and spread like a virus through your team. It might be one of the reasons good staff members seem to leave or your turnover rate seems extra high. And consider this: your staff members are the ones preparing the meals for your guests and creating their experiences with your restaurant. If your culture becomes one of drama or negativity, it won’t be long before your guests will be able feel (or even taste!) it. OK, so culture is an outcome …. but an outcome of what exactly? 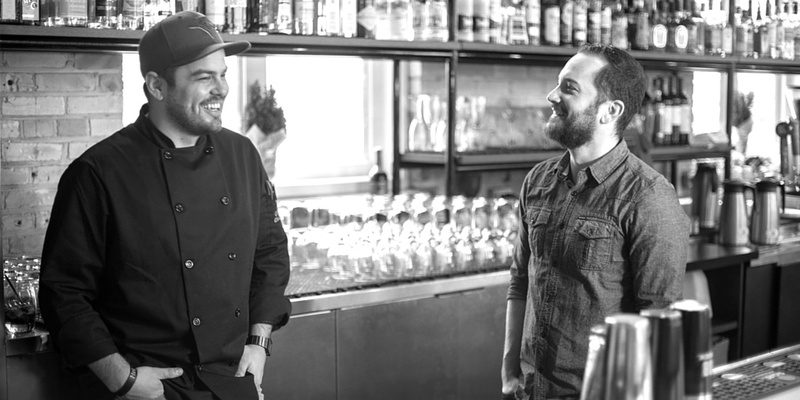 When you break it down, there are a few aspects that influence your restaurant’s culture. Once you’re ready to get intentional about shaping your culture, here are four to areas to consider: people, place, process and purpose. 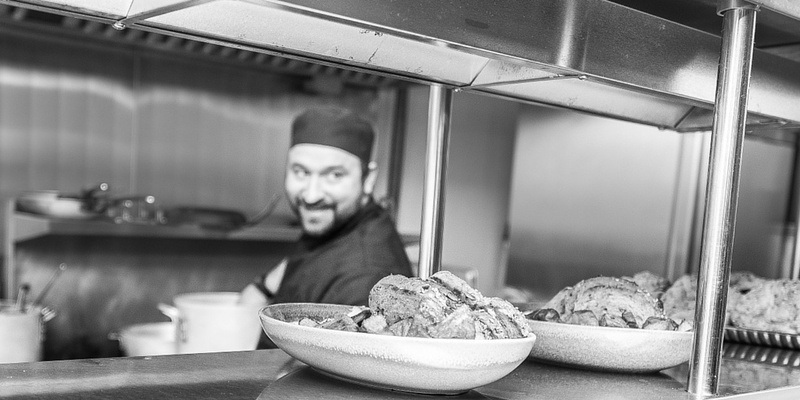 The people on your team play a huge part in building the culture of your restaurant. They set the tone for new employees who come on board. 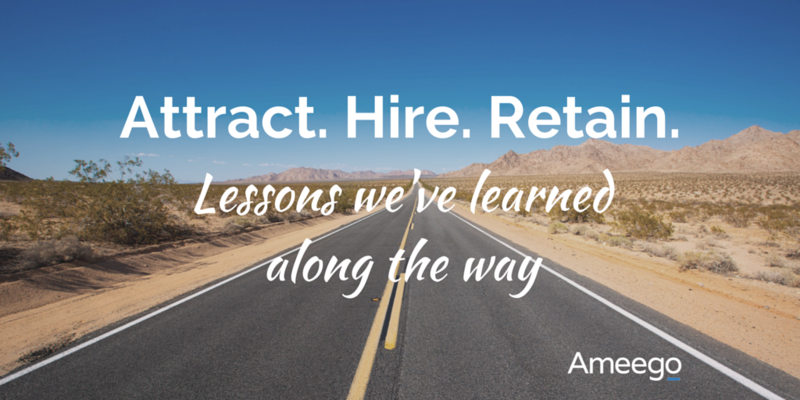 Explicitly or not, existing employees teach newcomers what is or isn't acceptable. Say you bring in a young person who has never worked in foodservice before. When they hear the kitchen staff or other more established team members in the back complaining about picky customers, for example, they learn that behavior is normal. There’s a famous business fable (loosely based on an actual scientific experiment), that starts with a roomful of monkeys and a ladder with bananas at the top. Every time a monkey climbs the ladder to get the bananas, it triggers cold water to be sprayed on all the monkeys. Eventually, after being sprayed a few times, the monkeys learn not to climb the ladder. Then when a new monkey is brought into the room, before it has a chance to climb the ladder and try for the bananas, the other monkeys stop it. Very quickly, this new monkey learns from the others that climbing the ladder is a no-no. As the story goes, one by one the old monkeys are replaced with new monkeys until none of the monkeys in the room have ever actually been sprayed by the cold water. But still none of them will dare climb the ladder. The story serves as a bit of a cautionary tale about the power of socialization – the idea “that's the way we’ve always done things” can be quickly passed to new employees. So take a moment to think about the “monkeys” on your team. Would you want their attitudes and behaviors passed on to new hires? Ameego’s Kris Edwards has a great article on how to attract, hire and retain the best employees for your restaurant based not only on their skill set, but also on how they will fit in with your culture – either the awesome culture you already have and want to maintain… or the ideal culture you’re trying to build. It’s likely that the décor and guest seating areas in your restaurant were chosen with care to create the right kind of atmosphere for your customers. But what about the areas only your employees see? Do you treat them with the same kind of consideration? It’s something that people in traditional office spaces seem to talk about more often – people ooh and ahh over cool and innovative campuses like Facebook or Google, or they debate whether open floor plans or closed-in cubicles are better for employee morale and productivity – but it sometimes gets relegated to an afterthought in restaurants. Look around some of your staff-only spaces and consider what messages you’re sending to your team. Sure, you know you need to keep your kitchen and food prep areas spick and span, but what about admin/office areas or storage spaces? Cluttered, disorganized or otherwise unkempt areas can cause safety hazards and foster inefficiency, but more than that it can send a message to your team that they aren’t valued. A little more care can do wonders to communicate the kind of culture you’re aiming for. Whether it’s fun and quirky or polished and professional (or anything in between), you set the mood for your guests … why not do it for your employees? Your policies and procedures – any of the formal or informal rules about how things are done in your restaurant – play a huge role in shaping your culture. One way to measure the impact of your existing processes is to ask who they benefit most. Is it your customers? Your staff? Your bottom line? There’s not a right or wrong answer; it’s a matter of aligning your goals with reality. There’s a saying that goes, “every system is perfectly designed for the results it creates.” So ask yourself: what results are your systems creating? Is that what you want? If not, something’s got to change! You can’t keep doing the same thing and expecting a different result. Let’s take time off requests for example. If you’re using a paper calendar or a binder in the back room where people are scribbling in their requests, what’s the impact of that? I can’t speak for your staff, but I remember one place I worked the book was always packed full of more requests than there were available spots (especially during the summer), and it always seemed to cause a long delay and a bottleneck as the manager sifted through and tried to juggle competing requests. The experience it created for the staff was one of uncertainty – never knowing until the last minute whether your request made it into the schedule. I often wonder if the manager ever questioned that process or tried to find a better way – it couldn’t have been fun for him either! Another way of identifying potentially broken processes is to watch for “shadow systems.” Human beings always seem to find the path of least resistance, so when faced with a process that is too labor-intensive or maybe even unnecessary, your employees will start making their own workarounds. Not really breaking the rules, but not quite following them either. Instead of insisting they do things by the book, take a moment to consider whether the system is in need of repair. Sometimes a policy or guideline just doesn’t make sense anymore. Or here’s something to think about: If your employees were to rewrite the rules, what would they do differently? Last but not least, consider the driving motivation for your business. When you walk into a place that has a purpose, you can feel it. New employees pick up on it. Customers can sense it when they walk in the door. And it’s more than just a mission statement tacked up on a bulletin board in the backroom. When your employees truly buy into a set of shared beliefs – those non-negotiable values that are at the core of your business – it impacts the way they behave. It’s something they can rally around and get excited about. Whether it’s making the best burger in the city, sourcing local ingredients, having the most knowledgeable staff, or being the place where the neighborhood gathers to watch the big game, the purpose you set for your restaurant radically shapes its culture. How would you rate your culture based on these four areas? If you’re not sure what your employees actually think and feel about your restaurant, maybe it’s time to gather some candid feedback. You could do this through a quick online survey to all staff or even in person with a few key team members. In either case – whether your culture is totally awesome or kind of dysfunctional – it never hurts to check in with your team and take some steps to improve. You’ll be amazed at the impact it has on your staff, your customers and ultimately your profit.